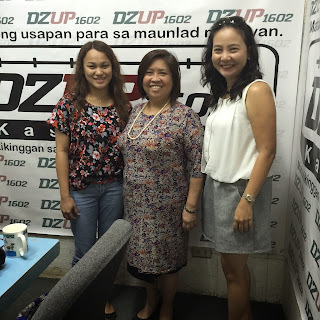 In celebration of the National Autism Awareness Month, DZUP 1602, the AM radio station of the University Philippines- Diliman, simultaneously streamlined live online at www.dzup.org extended its invitation to Autism Society Philippines to discuss autism and what more should people know about this case in an episode entitled “Matinong usapan para sa maunlad na bayan”. characteristics, triggers and prevalence of Autism in the country. In addition, Ms. Bermudo also informed the public about Autism Society Philippines by extensively discussing ASP’s organization profile; members, chapters and leadership; programs and services; public campaigns and the newly launched A-OK Philippines. Government laws and programs that are designed for the enrichments of the benefits available to persons with autism and their families were also explained. The hosts were so moved by ASP’s “1Pangako campaign” that towards the end of the program, they signified their interest in helping spread awareness about not using the word “Autistic as a joke”. They started it by playing the entire campaign song “1Pangako” to close their “Wais Spend” episode for the day.